Alissa Walker at Curbed.com talks about Campbell, California's innovative underpass design solutions. East Campbell Avenue received a makeover that can be replicated across the United States. "The design uses the existing structural framework to keep key girders in place, then carves out more space for pedestrians, excavating 4,700 cubic yards of dirt from the sides. A second retaining wall creates a stunning 11,000 square feet of space for walkers to travel beneath the freeway. 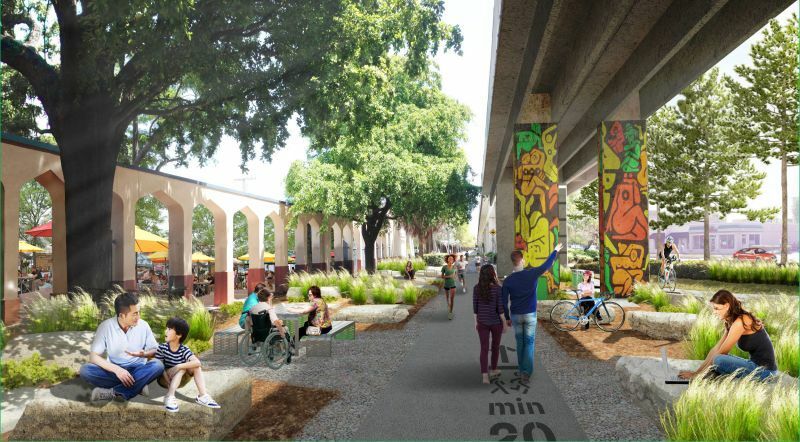 Lighting, artwork by Susan Zoccola that depicts locally grown produce, and wayfinding was also added, and new bike lanes now clearly demarcate the roadway."